These are our favorite deals on everything pumpkin spice. 1. Pumpkin bread mix. You can splurge on the $9.99 bag of pumpkin bread mix by Pamela’s at Whole Foods (don’t forget to add in the cost of the can of pumpkin!) but we like Pillsbury’s Pumpkin Bread Mix – no can required – which is $7.98 for a set of 2 mixes at Walmart. 2. Pumpkin macarons. These tasty pop-in-your-mouth treats make for a classy party dessert. The ones at the Whole Foods’ bakery are $2 apiece, but Trader Joe’s sells a 12-piece package in the frozen section for $4.99. 3. Pumpkin pasta sauce. Our favorite brand is Cucina Antica Tuscany Pumpkin Pasta Sauce. It sells for $7.49 at Whole Foods, but we found it at Target for $5.99. Prefer a cheesier taste? World Market’s pumpkin pasta sauce is only $3.99 on sale. 5. Pumpkin yogurt. Brands vary, taste varies. We found Yoplait’s version at Walmart for $.58, Dannon Oikos yogurt for $1.00, also at Walmart, and Trader Joe’s Greek yogurt for $1.29. We liked the Trader Joe’s brand best. 6. Chai pumpkin spice tea. You can splurge at The Coffee Bean and Tea Leaf, or you can make a cup at home. The tastiest we found was Tazo Chai Pumpkin Spice Tea Latte, available at Target for $2.99 for 32 oz. 7. Pumpkin butter. This seasonal spread is a yummy alternative to jelly. We found it at Trader Joe’s for $2.29 for 10 oz. and at Target (Archer Farms brand), also for $2.29 for 9.5 oz. You’ll pay more at World Market for Oregon Grower’s $3.99 12 oz. jar. 8. 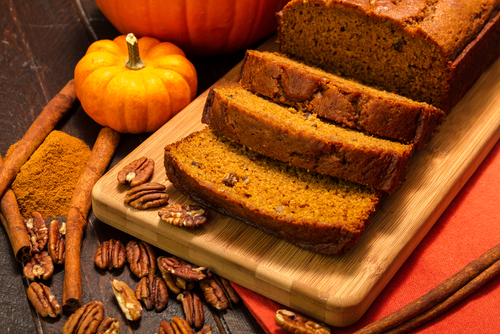 Gluten-free pumpkin bread mix. For those avoiding gluten, the prices tend to jump up a bit. Whole Food’s XO Baking Mix’s gluten-free pumpkin bread mix will run you $7.99 but we thought Trader Joe’s mix for $3.99 was a winner. 9. Pumpkin cookie butter. $2.29 at Trader Joe’s will buy you a little taste of heaven. Trust us. 10. Coffee-Mate Pumpkin Spice Creamer. We found this on sale for $2.99 for 32 oz. at Ralphs/Kroger. Have a delicious pumpkin spice flavored coffee for considerably less than Starbucks. What are your favorite pumpkin spice deals?